Urban and dynamic, this Portland condos, lofts and townhouse popular neighborhood called the Pearl district is an eclectic center for artists, restaurants, urban professionals, cafes, galleries and boutiques. This is one of the preferred areas in Portland with ongoing transformation of warehouses into condominiums. 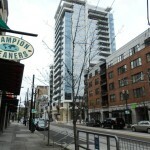 This Portland condos area is central and connected to everywhere by the MAX rail line. With its high concentration of chic boutiques and restaurants, the Pearl has become a city-wide destination for shopping and dining. In addition to name-brand retail stores like Anthropologie and Diesel, the area features independently owned clothing boutiques like the fabulous, frequently updated selection at Mabel and Zora’s (748 NW 11th Ave) or the simple, posh fashion at Parallel (1022A NW Johnson St). From upscale and minimalist to down-to-earth and eclectic, the Pearl has a wide variety of stylish decor shops; Hive Modern (820 NW Glisan St) is a local favorite. For our book lovers there is our famous Powell Books and for the sport activist, REI. Dining options are many and include classic Italian fare at Mama Mia Trattoria (439 SW 2nd Ave) or tapas at Andina (1314 NW Glisan St). This town’s loves its microbrew, so it’s no surprise that Bridgeport Brewery (1313 NW Marshall St), Deschutes Brewery (210 NW 11th Ave) and Rogue Brewery (1339 NW Flanders St) each have their own brewpub outposts in the area. It’s easy to navigate the Pearl. Avenues, which run north to south, are ordered such that street numbers increase as you move west from the river. The first letter of east-west street names go by the alphabet; as you move north from Burnside, you’ll find Couch St, then Davis St, and so on to Yeon St. This logical grid scheme makes it easy to find a particular intersection. The Portland Streetcar puts Downtown and Portland State University a convenient, 4-minute ride away and puts shopping along trendy NW 23rd Ave within striking distance. The area is well served by public transportation; one can catch the MAX as well as many of Tri-met’s bus routes along the bus mall on NW 5th and 6th.